You can reach your lifelong goal in just seven contacts. Seven people make the difference between you and landing that perfect job or receiving that opportunity you have always wanted. Now you just keepworking hard and meet those contacts! A solid work ethic will advance you to higher positions and present you with opportunities, but by knowing the right people you can amplify the effects of hard work. 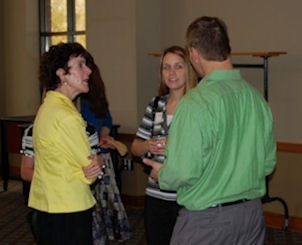 Luann has the tricks and knowledge to making yourself memorable when meeting people. She can enhance the quality of your small talk and help you create long term relationships with acquaintances. Her savvy socializing techniques will have you making some nifty networking with a large variety of people, building a strong system of contacts to help you reach your goals.